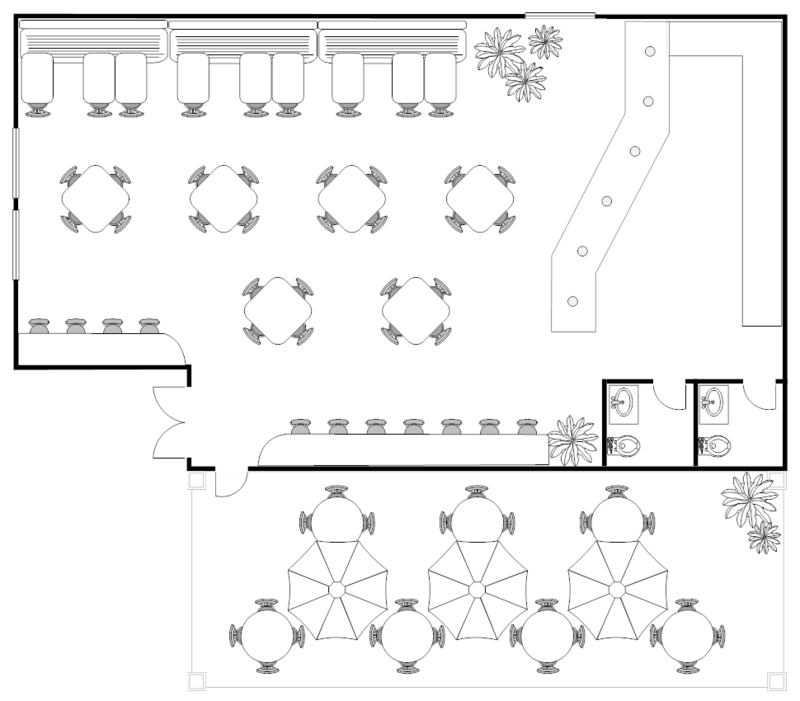 Designing a restaurant floor plan involves more than rearranging tables. Your restaurant layout both supports operational workflow and communicates your brand to patrons. Experts agree that a 6-step approach works best, starting with allocating space to your kitchen and dining areas. A 40/60 split is the rule of thumb but can vary based on your dining concept. A good floor plan can streamline your restaurant operations when it’s connected to your point-of-sale (POS) system. Lightspeed Restaurant is a cloud-based POS that combines kitchen and inventory management, payments, staffing, and detailed reporting, all in one system. It also lets you create real-time floor plans that make it easy to add or remove tables on the fly and color indicators that show which tables are free, occupied, or ready to pay. Start a free 14-day trial. The Kitchen — In most restaurant floor plans, the kitchen takes up about 40% of your space. This might seem like a lot for a space that patrons never see, but it’s the heart of your business. It’s important that you start here on your restaurant floor plan so you don’t shortchange this area. Restrooms — If you can place restrooms near your kitchen area, you can save money by tying into nearby plumbing and water lines. Depending on the size of your space, it can be a good idea to add a staff-only restroom and changing area, too. Bar or Countertop Area (Optional) — A bar or counter service area can be a great addition to a restaurant space, even if you’re not a bar or quick-dining establishment. It provides a comfortable waiting area if space is tight and adds popular counter seating for casual dining concepts. 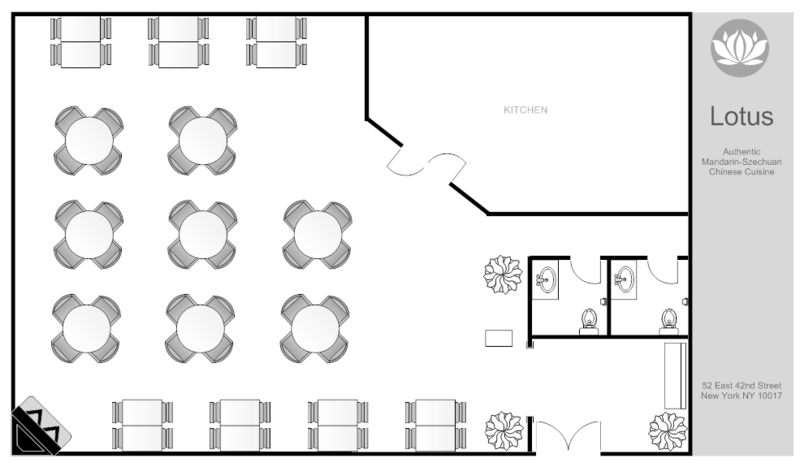 The Dining Area — This is the comfort zone of your restaurant floor plan. Adequate seating and traffic flow are the two most important ingredients in this space. After that’s established, you can apply design elements that communicate your concept and brand. Your goal is an inviting, comfortable space that pulls patrons in and makes them want to return. The Entry & Waiting Area — Your entry is the billboard for your restaurant. It should communicate your concept and entice passers-by to enter. Once inside, the greeting and waiting areas depend on the type of establishment. For fine and casual dining, this area needs serious consideration if you have wait times. For fast dining and cafe concepts, this space can be minimal, especially if you have a bar for counter service. Clearly, there’s quite a bit to consider in your restaurant floor plan and addressing everything correctly takes time and money. 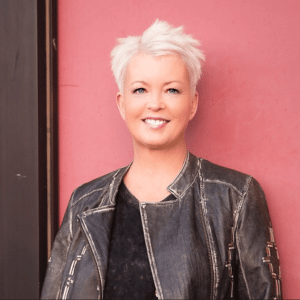 But there’s one shortcut in this process that successful restaurateurs often implement, and that is: Don’t re-create the wheel. If you can find an existing space with key elements already in place, you’ll save both time and money in your launch. With an existing space, you’ll still need to tweak and change some elements. But, Cordua says, remodeling costs are a fraction of what you’d spend on a new kitchen construction, so it’s something to consider. Cordua also recommends finding a commercial real estate pro with restaurant experience to help you find the ideal restaurant location to rework and also assist with loans and financing options. However you secure your space, once you start to sketch out ideas, an online restaurant floor plan maker like SmartDraw simplifies the entire process. 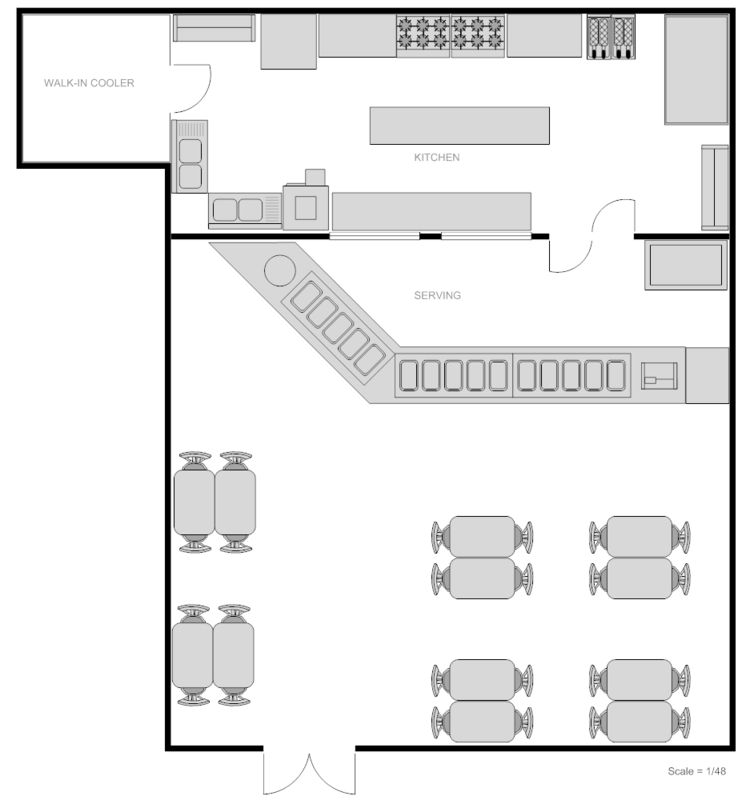 We feature several of its ready-made restaurant floor plan templates below for inspiration. 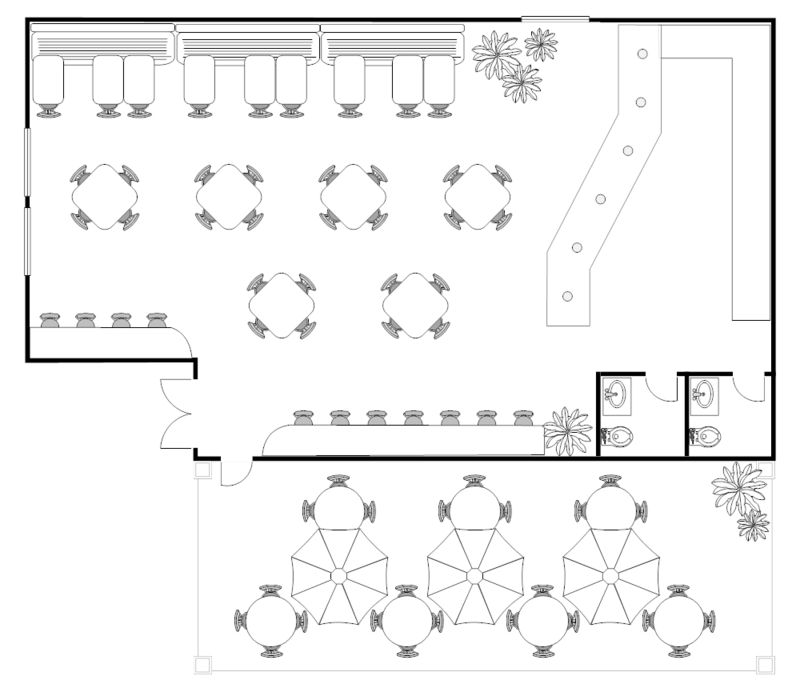 Now, let’s explore each of the key elements of your restaurant floor plan in detail. 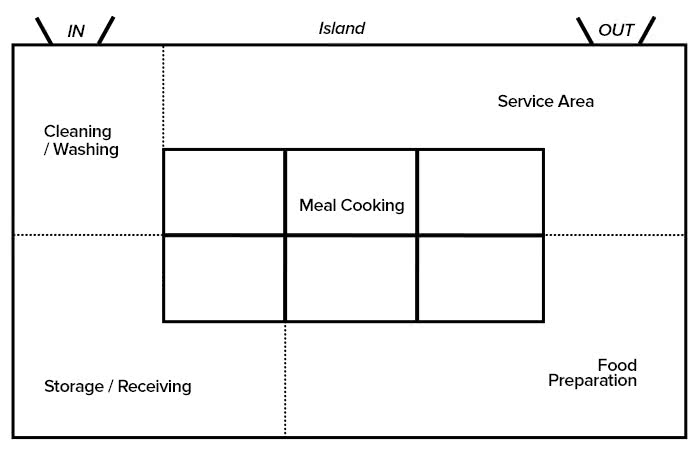 An island-type kitchen design, shown above, creates an open workflow between prep and cooking stations. Once outlined in your restaurant floor plan, your kitchen space also needs attention. Here are the 3 primary commercial kitchen designs that restaurant use: Assembly Line, Island, and Zone. This commercial kitchen layout provides 3 distinct areas for food production. It moves raw foods through a series of parallel stations from prep, cooking, and plating to server pickup. This setup tends to keep staff within defined workspaces with less movement between stations. The Assembly Line kitchen design is the go-to layout for many restaurants. To be successful, it’s critical that a restaurant produces food efficiently with minimum labor. 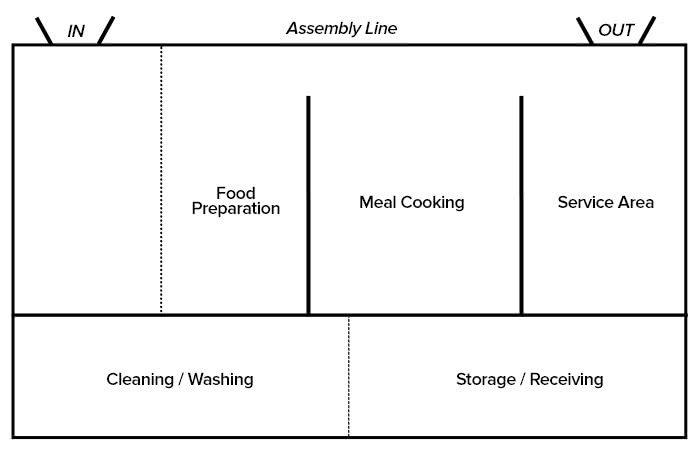 A kitchen setup that runs parallel lines for food prep, cooking, plating, and server pickup tends to be the most effective use of space to move food along an assembly line from raw to plate. Many experts agree that the assembly line kitchen the most efficient setup for a volume operation, like a busy restaurant or institutional operation. But it also works well in smaller operations, especially those that produce similar menu items, like a sandwich or pizza shop. An island design allows more staff movement and supervision between stations than a parallel assembly line setup. All cooking equipment: ovens, grills, fryers are centralized, and the other work areas line the perimeter, effecting a circular flow for food production. This layout works well in a larger operation, but can also be effective in a smaller operation where staff needs to move among prep and cooking stations to cover multiple kitchen roles. An Island kitchen layout allows ample movement between stations and maximum supervision. 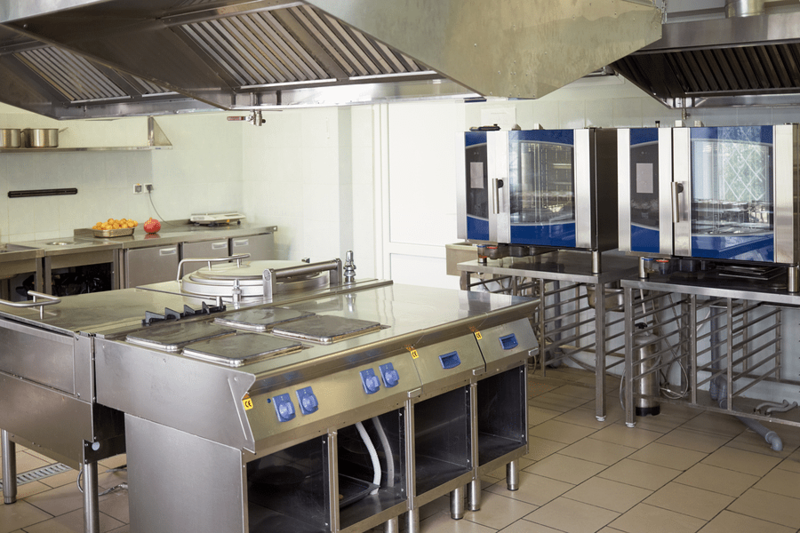 Like an Island kitchen layout, a Zone design can allow for more staff movement and supervision between stations than an Assembly line kitchen plan. With ample server access to both prep and cooking zones, this can be a good setup for a restaurant that cooks only a portion of its menu and uses prep to produce uncooked foods. This kitchen workflow can be adapted to a variety of kitchen shapes and sizes, so it’s one to consider if you have limited space. A Zone kitchen layout works in a wide variety of kitchen sizes and shapes. Whichever kitchen layout fits your needs, it’s a good idea to test your plan before installing any permanent equipment. Have staff walk through workflows to ensure there are no traffic jams or rubbed elbows. Then you can lock the equipment in place. Restrooms should be accessible, but separate, from the dining area. Having a restroom door that adjoins a dining area isn’t a comfortable situation for anyone. In the restaurant floor plans below, you’ll see the restrooms are adjacent to the dining areas, but do not open directly onto the dining room. This type of setup is convenient for all. Restrooms should be easily accessible from dining areas, but not open directly onto the dining room floor. It’s a good idea to consider restroom placement after you’ve identified your kitchen space in your restaurant floor plan. Placing your restrooms near kitchens can save you money on your plumbing by tying into nearby lines. If that’s not feasible, you’ll have to completely plumb this area, so place your restrooms carefully. This isn’t an element that’s easily moved about the space. Finally, don’t be stingy with restroom space. Your patrons will remember a bad experience in this particular area. Restrooms should be roomy, not tight and cramped, and fitted with easy-to-clean fixtures and finishes. Bar or countertop dining areas can be a great addition to your restaurant floor plan. If you haven’t considered one, you should if space allows. It’s a more profitable use of space than a large waiting area since patrons can order drinks while they wait. Plus it creates small-footprint dining space since diners expect less elbow room at a bar than they do at a table. For placement, a bar or countertop that shares its back wall with the kitchen works very well, especially in small spaces. That lets you tie into your existing plumbing for bar sinks, plus you can add a pass-through window to the kitchen for a diner, cafe-style coffee house, or bistro restaurant concept. Dining rooms that mix seating and styles offer patrons their choice of comfort. 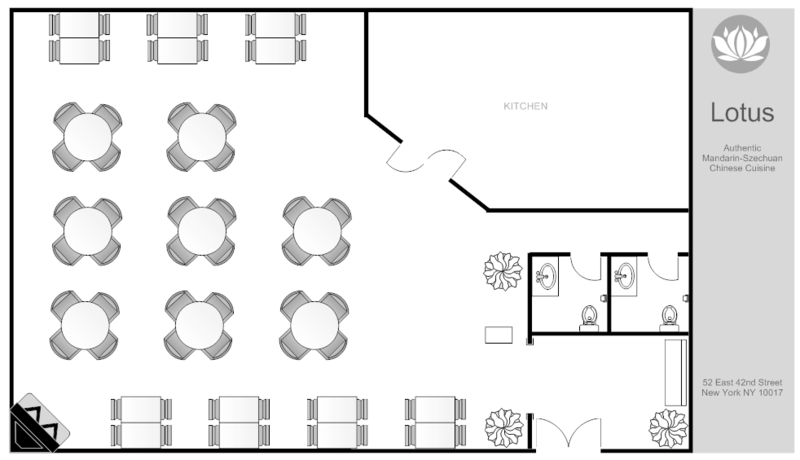 Your dining area (or dining area plus bar or counter) should use around 60% of your restaurant floor plan. Within this space, you have many table style and placement options. What you do here really depends on the type of dining concept you’re operating. Communal dining experiences and open-concept restaurant layouts are very on-trend and translate well to smaller spaces. In open-concept dining, keeping the area open to the kitchen is a budget-friendly solution, as is an exposed ceiling with elements like ductwork and pipes visible and part of the design experience. The first step in this equation is checking with your local building permit office for occupancy guidelines for your space. Experts recommend checking the ADA guidelines for accessibility as well. Having all of this information up front ensures that your dining area layout and floor plan meets applicable regulatory guidelines. Booths maximize wall space and mixing them in with tables gives patrons their choice of seating. Many dining concepts even add trendy countertop-height tables to the mix, which creates an inviting atmosphere and adds visual variety. Plus, tables can be easily moved to accommodate large parties or to change the look and flow of your space. So it’s always a good idea to include a table section into your plan, even in a small dining space. 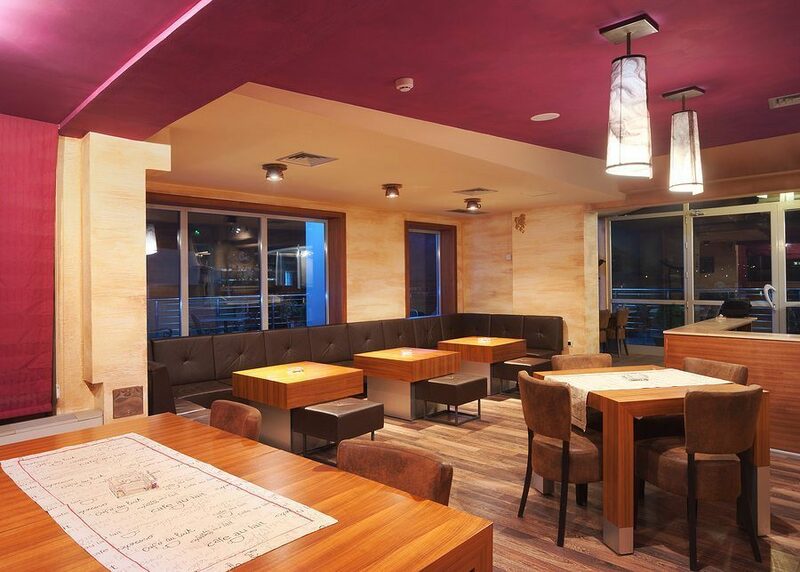 Your dining area is also where you’ll boldly communicate your restaurant concept and brand. 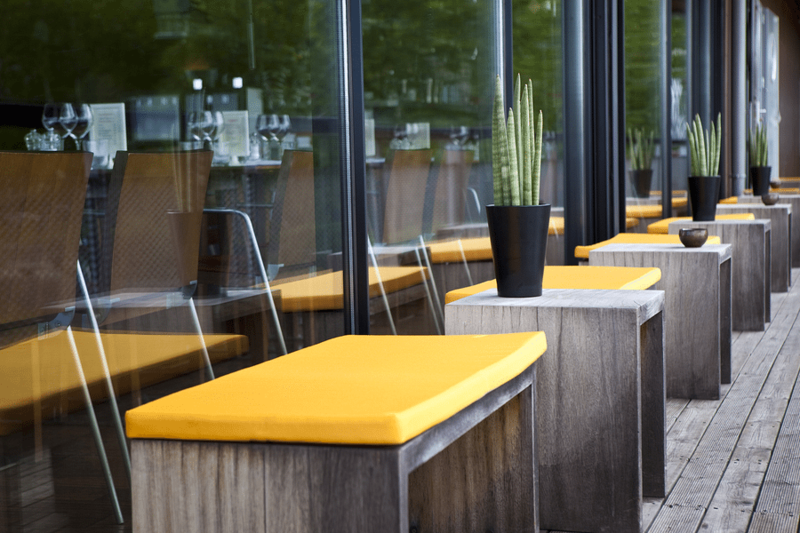 Color schemes, design materials, decorative accents, textiles and finishes, and even tabletop and seating choices all play a part in your dining brand. So, be sure to really consider what your brand is and how you can deliver the experience through visual and tactile means. You need to be able to communicate your dining concept to someone else in a few sentences, like an elevator pitch, and have them get it. If you can’t, then you’re unlikely to translate your concept into a viable look and feel. You must understand what makes your concept unique and different to develop an artistic and decorative vision. But this part of the equation doesn’t have to run up a huge design bill. Where are your favorite places to dine? What look-and-feel experiences inspired you to open your operation in the first place? Look to these as sources of inspiration, but don’t feel that you have to blow your budget on high-dollar decor and fixtures. Startup restaurants and bars have the typical challenges that most commercial and residential spaces have… money! You have to get creative in your design when the budget is tight and there’s not a lot left over for the “pretty.” That’s where vintage/flea market/thrifted pieces can come into play with big budget items. Plus a mix just makes the space that much more interesting. Vintage finds can help you craft eclectic elegance on a budget, but they’re not reserved for low-budget spaces. 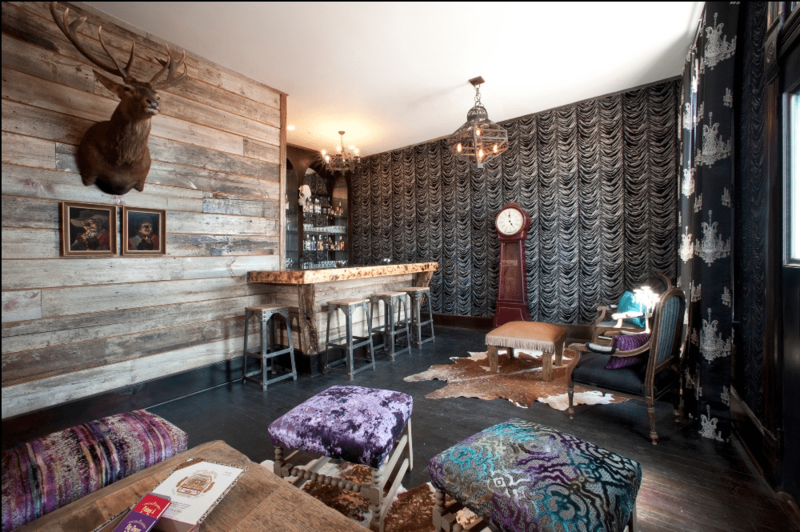 This upscale bed-and-breakfast’s bar and lounge combines vintage pieces with a clever mix of textures to define three distinct serving and seating areas within a limited space. 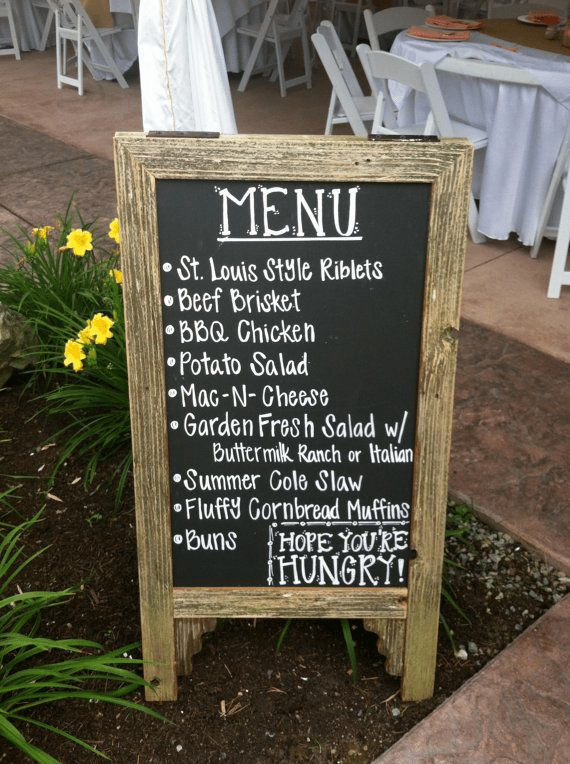 Do You Offer Patio or Outdoor Dining Service? 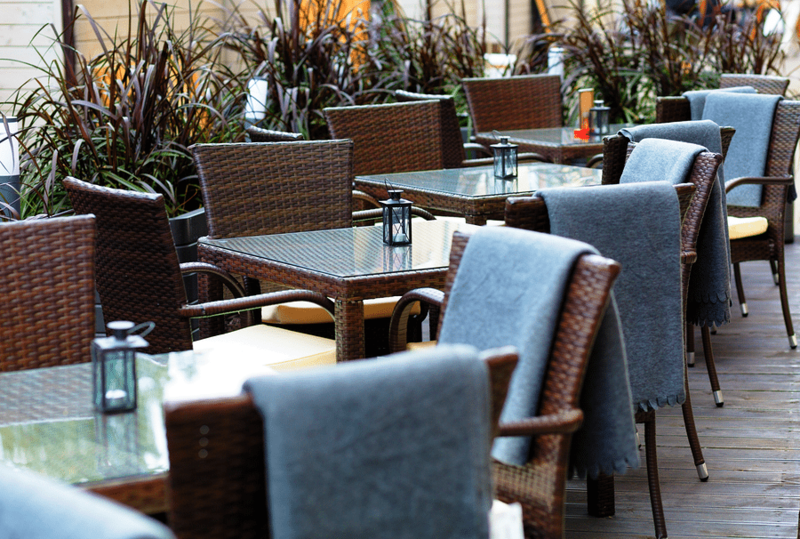 Outdoor dining spaces can be casual or chic as long as patrons and waitstaff aren’t cramped. In outdoor spaces, plan for adequate walking space between tables and umbrellas (if you use them) to ensure patrons and waitstaff don’t have to crouch to avoid colliding with an umbrella. Also, plan for wide walkways and aisles that run alongside plants. Patrons aren’t too fond of squeezing by the greenery to get to their table. Outdoor waiting spaces are ideal when interior space is scarce. 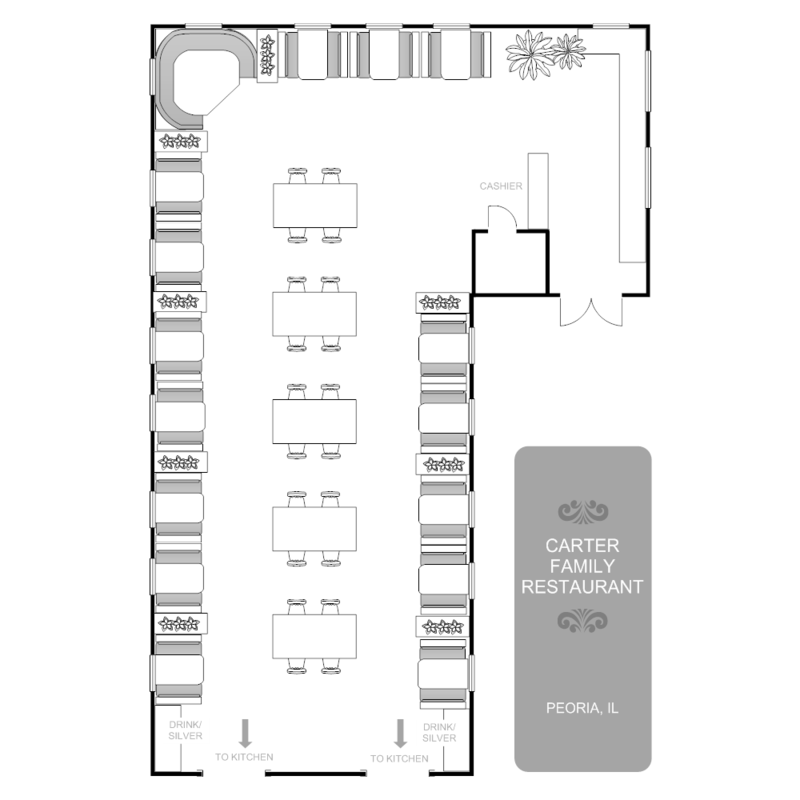 The last place we cover in your restaurant floor plan is the first place your patrons see. Yes, your entrance is every bit as important as the other areas in your floor plan covered above. But it’s last on our list because most experienced restaurateurs work from the back-of-house (kitchen) forward when designing a restaurant floor plan. This back-of-house to front-of-house design approach ensures that you don’t over-allocate space to the entrance, waiting, and dining spaces at the expense of your kitchen, which is always a mistake. Only after defining your kitchen and dining spaces in your restaurant floor plan should you allocate space for your waiting area. For cafe, bistro, and diner concepts, your entrance can be minimal, especially if you have a bar or countertop where patrons can wait. If you need defined wait space up front, plan this area to allow traffic flow in and out, and accommodate seating if at all possible. A few comfortable chairs work, but bench seating against the wall can be a better use of a tight space. And, if it works in your location and climate, adding outdoor seating to your wait space can be a good idea. A few patio-type chairs or benches can do the job with style. Entrance signage costs little and attracts attention from passers-by. Like your dining room, the design of your entrance should clearly communicate your restaurant concept and brand. This is the first visual and tactile experience your patrons have when entering your establishment, so carry your dining room design choices forward to your entry, and even beyond. 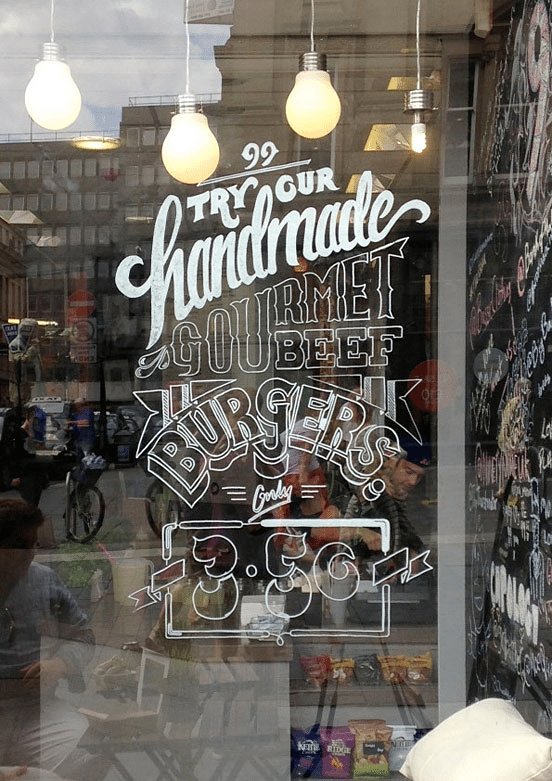 Even on a limited budget, you can impart your brand with entry signage on windows or chalkboard walls. Or, simply customize your door to compliment your signage and brand concept. Your restaurant floor plan dictates the workflow of your entire operation, from kitchen and dining areas to customer amenities like waiting areas and restrooms. In restaurant design and layout, every element has a purpose and there should be no afterthoughts. 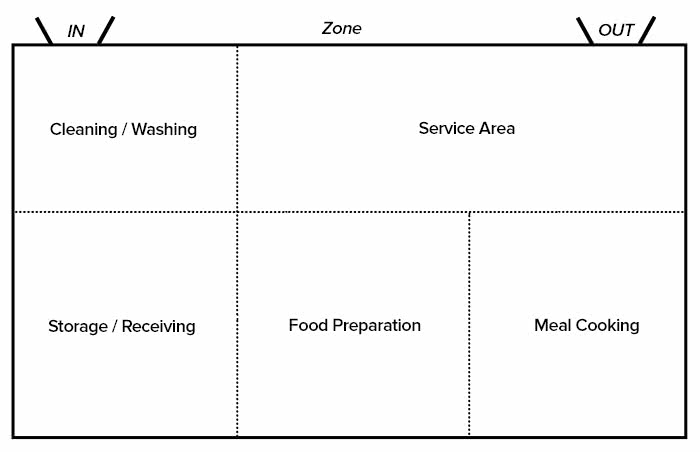 Experts agree that the first area to identify in your restaurant floor plan is your kitchen. Allocating about 40% of your total area to the kitchen is a good rule-of-thumb. Next, ensure that your kitchen space can accommodate a smooth prep, cook, plate, and serve workflow. 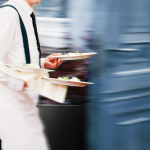 An assembly-line approach is recommended for most establishments running a crew. After that key step, other spaces can be placed into your restaurant floor plan and you can start working on the visual appeal, both indoors and out. Don’t forget to check out Lightspeed Restaurants which makes managing your floor plan and restaurant a breeze. It lets your servers and managers update your floor plan in real time to accommodate last-minute reservations and big groups and quickly check the status of a table for faster service and turnaround. Try it free for 14-days. Dear Krista Fabregas, your 1st step Floor Plan is vary helpful for me. I’m a newcomer in restaurant business. I was too much worried about my The Entry & Waiting Area. But now i can feel free. So i’m very glad of you. With Thanks. I’m glad it was helpful, thanks for reading and commenting. Good luck with your new restaurant venture. What is required to become a “ start up” restaurant consultant? 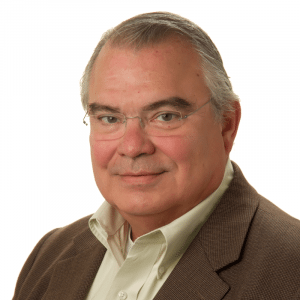 I have 32 years in building,owning,managing and selling three successful concepts from the idea to the sell of the restaurant. I also have 16 years in food service equipment sales for the largest food service equipment dealer in the nation. I have been designing layouts for free and now I would like to be able to charge for my services. I’d say expertise in helping budding restauranteurs find the right location, set it up, and launch is all you need. I’m not aware of any official credentials or licensing for concept and planning consulting in general. You just need to package yourself well, market your skills, and get the word out. 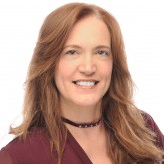 Of course, you can’t bill yourself as an interior designer or other licensed professional if you’re not, but as an advisor and consultant, experience is often what’s needed. Good luck! 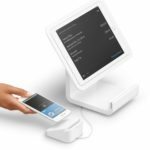 Lightspeed Restaurant POS - FREE Trial!